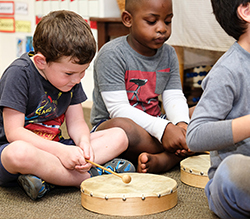 Music is one of the most potent performing arts and can have a great effect on a child's total development. Children participating in music, achieve some or other form of success, considering that it is experienced individually. This success leads to a sense of confidence and self-worth and gives the child courage to attempt more difficult learning tasks. In order to give a child a well-round education, music should be included as a basic subject. Children who participate in music have acute listening skills, are better focused and mentally more advanced. Music generally makes children happy! Nurturing of your child's musical ability will lay a foundation to be utilised for the rest of his/her life. 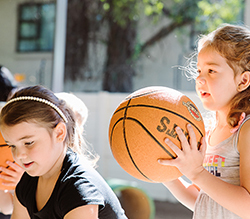 Whilst on the playground children are given the opportunity to engage in physical activities. Muscle development and muscle co-ordination can be promoted only through the muscle movement of a child. Bonthuis' environment and the guidance of staff, leads to the constructive acquiring of skills. Through constant practice they investigate and master their environment and their physical abilities with the help of suitable equipment, space and freedom. Games are organized in such a way that there is an opportunity for climbing, crawling, walking, jumping and running. The playground area also accommodates the child's need for fantasy play and imaginative game discoveries. Touch perception is enhanced by sandpit play and different textures found on the playground namely: grass, leaves, and a variety of textured sand. A rich and extensive vocabulary is one of the best ways in which to equip a child for life. It not only serves as a great influence on literacy skills, but also functions as stimulation for further learning skills. 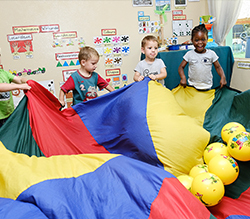 These skills influence a child's potential for formal education and school readiness. 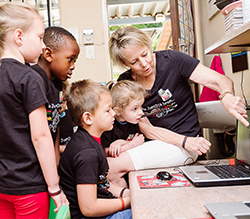 At Bonthuis, each age group is educated in both English and Afrikaans. However, from the 4 year old age group we accommodate the need for specific language preference, as determined by the parents. Specialised facilitators focus on the refinement and the acquisition of language skills. • To establish a feeling of respect and love as well as an appreciation for the English language. • To develop the skills of listening (receptive) and speaking (expressive). • To develop the ability to communicate effectively with confidence and the necessary politeness in English. • To increase the child's vocabulary, promote language purity, pronunciation and pay attention to language enrichment. • Cultivate a love and respect for books as well as an interest in reading. • To stimulate his/her imagination and to guide him/her to use the language in a creative manner. We make use of "Just Click" computer aided training as it enhances our curriculum to the full. "Just Click" strives to create a higher percentage of individuals that are emotionally, intellectually, and technologically well equipped to contribute positively to the social and economical prosperity of the country. 50 Different skills are continually stimulated, developed and evaluated to ensure that any slight or serious developmental problems are identified and aid is given timeously. Learners with a high learning capacity are encouraged to develop a higher standard and to further their potential. 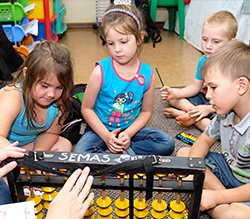 A maximum of 5 learners are accommodated at a time, ensuring individual attention. Lessons are presented in an enjoyable, up building manner in a relaxed atmosphere, in the known surroundings of the school. Reports are issued 3 times per year based on evaluation done during the term. Continual feed back is given to teachers as to the progress of learners, and their development. By special request of the parents, the child may enrol in additional extra-mural activities. All of these are presented by fully qualified, highly competent teachers with many years of experience in training children.